The 16.13 sapphire arrived in our office and at once we understood her desire. Her desire to be more beautiful and more brilliant. Mostly, we understood her desire to become that which she was intrinsically, which she was meant to be and that she could never be without an artists hands to guide her emergence. Set aside and parcel worn for 37 years in a chunky gold ring, time has ravaged the 16.13's exterior shell. While the original native cutter sought hastily to facet her for weight retention, our goals are more ambitious than simply removing abrasions by polishing another cutters form. Our goal is to release the beauty within by replacing, re-shaping or removing that which interrupts beauty and harmony from greeting the passing eye. No, treatments, enhancements or cosmetics are needed other than an entirely newly faceted face and top for starters. Challenges? Yes, there is always the uncertainty of outcome yet somehow once the work begins an unspoken confidence emerges and hands, eyes and diamond crusted spinning cutting wheels begin their organically coordinated symphony of transformation. Beyond that which we can transform, nature ultimately calls the tune presenting limitations within the materials natural composition - like the silk running through this gems interior - that form the current carrying the cutters ship to shore. We, may only steer her into port. Who better to conduct this transformational gemological passage than the workshop of Reginald C. Miller under the stewardship of master lapidary and longtime associate, Jerrold Green? The Cutter's Window gives you VIP entry to the master cutters legendary workshop in a manner not even the world's most powerful gem professionals have accessed. Watch a centuries old art & process unfold! You're about to go behind the scenes and mind-meld with the same person who cuts the world's most important gemstones routinely. He's going to share with you what he's thinking and he's going to share with you what he's doing - as he's doing it! This oval natural un-heated 16 carat Ceylon Sapphire has promise under it's battered shell. The cutters goal here will be to introduce a balance of face-up improvements by replacing heavily abraded facets with a more simplified ordered classic symmetric design. While the gems' interior mandates a textured glow versus a mirror hard blue transparency, we believe there's greater beauty here to be found. We'll begin by measuring the benchmarks of quality as we perceive it to be in the 16.13's current iteration on May 8. 2017 prior to cutting using our proprietary CherryScoring™ graph as shown. 16.13 carat natural un-heated Sri-Lankan Oval Sapphire. The gem exhibits considerable silk that runs across the face of the gem. Can cutting mitigate it's presence? The gem is heavily abraded and parcel worn. The gem's prior faceting will need to be replaced entirely on the front with our signature modern "ordered" oval style, while the backside will require a hybrid approach of mixing modern and native in one. The gem has color zoning especially in the culet / pavilion area which may make it difficult to disperse color from the center as the cutter endeavors to close the window. With our baseline now documented, we can begin. Welcome to "The Cutters Window" where Cushion Gem will train it's focus on the handwork of the lapidary artist and the fruits of their specialized labor. Enjoy! 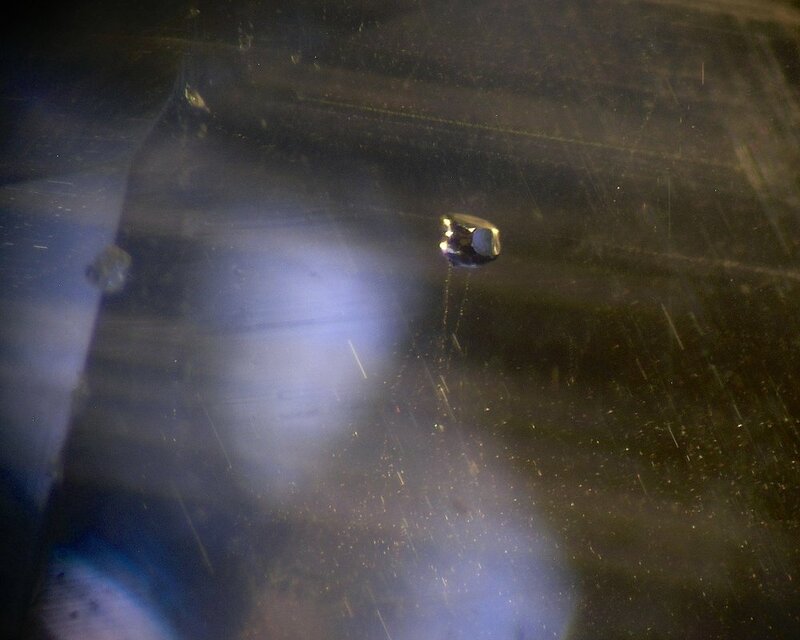 How can we truly assess if a gemstones face up appearance improve after cutting without engaging in high-tech analysis? By having two similar sapphires by which to compare it to before & after cutting, of course! Watch Jerrold Green meticulously mount the 16.13 oval sapphire onto the dop stick in preparation for it's makeover. Green summarizes this initial process by explaining in detail why this simple act of mounting and observing the gem in the dop stick is crucial in determining how he will shape the gems table to girdle re-cutting. NOTE * gem color cannot be assessed accurately while the gem is in progress on the stick. Sapphires in particular - when unpolished as in this photo - appear more saturated and opaque under these conditions.